Glass Paradise is an artist-owned business featuring the flameworked creations of Mark Black and friends. We specialize in custom items made to your specifications (an exclusive advantage of buying direct from the artists). Our studio / shipping facility is located near Joshua Tree National Park, in sunny Southern California. Believe it or not... we vaporize pure gold and silver every day! Click Here to learn more about our "Reverse Alchemy" process. Mark Black originally hails from the seaside art colony of Laguna Beach, CA. Mark developed an early appreciation for glass at the age of ten (on a renaissance art tour of Europe) as he watched a glassblowing demonstration on the island of Murano, Italy. This experience left an indelible impression, kindling a lifelong passion for hot glass. Mark's first exposition sponsored by the Laguna College of Art and Design / Art Institute of Southern California was very well received, encouraging him to pursue a hybrid program: Art History, Figurative Sculpture, and Visual Communication. Glass Paradise Lampwork Studio at Lake Tahoe in 1997. 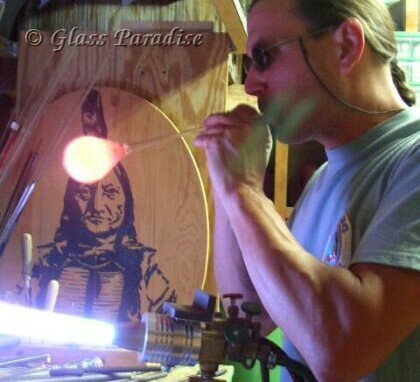 Glass Paradise.com is the manifestation of Mark's lifelong dream, enabling collectors to participate in the creative process. Thanks for visiting! 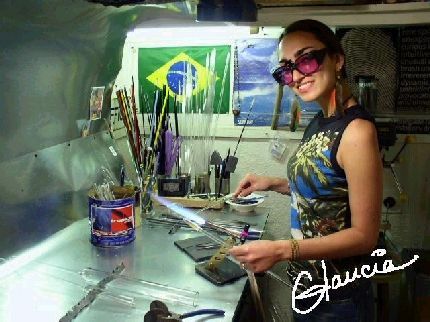 Glaucia Rubick was born and raised in Florianopolis, Brasil. 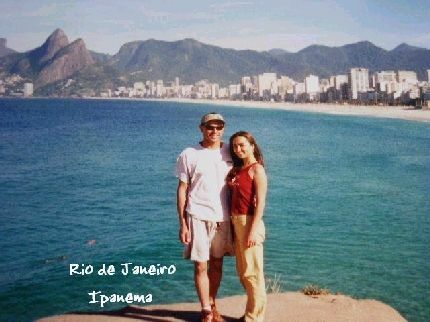 Her idyllic upbringing on a tropical island (surfing mecca) cultivated within her a deep appreciation for the exquisite beauty of nature, along with an uncanny talent for visual communication. While attending law school, Glaucia visited Tahoe for a ski vacation and quickly became an integral element of the Glass Paradise South shore staff. As our chief designer during the early years, her research & development is responsible for many of the top selling products you see on our website today. Whether it’s an unsigned utilitarian item or one-of-a-kind gallery piece, we take great pride in the quality of our work, creating art glass (with our own hands) which will bring joy to others for many years to come. As our business has grown, we’ve tapped our network within the flamework community, forming a symbiotic artists co-operative in the process. Each flamework artist has their own unique style. Therefore, we only stand to benefit by showcasing the work of our friends, associates and guest-artists as this improves the overall selection of goods available to our visitors. Open 24/7 for your shopping convenience, our online store is filled with totally unique gifts you won't find anywhere else in the world! We will strive to impress you with our products and service, because we sincerely appreciate each & every customer. All glass shipments are carefully packed to ensure that your item/s will arrive in perfect condition. We regularly ship our products worldwide. Broken/damaged merchandise is not a frequent problem, and yes we absolutely guarantee that your glass order will arrive in one piece. Satisfaction Guarantee: any item may be returned within 7 days for a full refund. Condition of returnables: as received. In the case of breakage, a photo will suffice. We are borosilicate lampworkers, which means that we melt tubes and rods of boro (hard) glass with a 2000 degree torch. "Hard" or borosilicate* glass is different from other types of glass because it has a finer amorphous structure, which requires a much hotter flame to heat it into a molten/ liquid state. Also, it remains fluid for a very short time (seconds). So, we must manipulate it directly in the flame. *Borosilicate glass was invented in 1893 by Otto Schott, for scientific / laboratory applications. Boron is included to create a highly heat resistant glass. The term "hard glass" refers to this higher reaction point to heat. You may have seen soft glass gaffers working (with a furnace, and a long metal tube). The "soft" glass stays fluid for several minutes while they blow and shape it. We prefer borosilicate because it has a superior structural integrity when it cools. This ensures that collectors will enjoy our art for a long time! The annealing process is an extremely significant aspect of any glassblowing operation. Whenever we add glass to another piece of glass, weld, or otherwise manipulate it...we are introducing stress to the glass structure. The only way to releive this mechanical stress is to "anneal" the object in question. This involves placing the glass in a kiln, heating it up to 1050-1200 degrees (just enough so it becomes fluid on the molecular level) then gradually reducing the heat, allowing it to cool slowly over several hours. This ensures that the glass will be stress-free / as strong or resilient as it can possibly be. *Annealing is the same process used in the production of Steel to allow the molecules to flow back into re-alignment after the steel has been shaped and formed. In much the same way, glass flows back into it’s polarized alignment and strongest state once properly annealed over the course of several hours in a specialized glass-annealing oven. Why is the flameworking / annealing process SO important to us? In recent years the glass market has become inundated with asian imports made with substandard glass (not Pyrex). Also, when glass is being produced in a third-world environment it's more than likely that energy-intensive kilns are unavailable. Which means the structural integrity is greatly diminished due to unrelieved mechanical stress. Overseas manufacturers may be content with products which hold together just long enough to reach the end consumer. However, this is shortsighted and ultimately degrades the market perception of handmade glass. Glass Paradise and our contributing artists would like you to know that we take great pride in using only the finest materials, and everything we make is properly annealed for a minimum of eight hours in our computer controlled kiln for strength and durability. Dichroic is a reflective coating created by the space industry. By using a high temperature vacuum furnace; titanium, silicon, and magnesium are deposited on the glass, then later vaporized creating a brilliant array of colors. When applied to clear glass, two (or more) colors are transmitted and reflected. In other words, the colors change when dichro is viewed from different angles / lighting conditions which causes it to shimmer and shine. Glass Paradise incorporates these shimmering elements into our designs, working them into an exquiste vortex of colors! The end result is a unique piece of opulent wearable art that will bring years of compliments to those who wear them. über-hip sites featuring every sort of scrolling, blinking, flashing doodad imaginable. Pulsating neon font over a dark background??? Half of art is knowing when to stop. At GlassParadise.com our #1 goal is providing customers with a pleasant shopping experience. In our humble opinion this means crisp, clean, quick-loading pages and a convenient shopping cart. If you ever encounter an issue with the functionality or design of our site, please contact us and give us a heads up. We value your opinion.